All our physiotherapists are members of the Chartered Society of Physiotherapy (CSP). and registered with the Health Professions Council (HPC) – the regulatory body for physiotherapy in the UK. alongside his NHS work, and full-time since 2006. 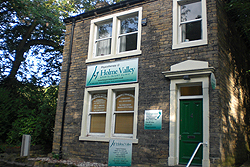 Jon took over as Director of the Holme Valley Sports Injury Clinic in January 2008. In April 2011 Jon took up challenge of his first triathlon. Since then he has competed in a number of triathlons throughout the UK, on behalf of the Holmfirth Harriers, and represents Great Britain in European and International triathlon championships. Craig graduated from Newcastle University in 2000, and has worked in the NHS and private practice since then. A keen golfer and rugby player, Craig has been able to develop specialist expertise in treating these two sports through his work as physiotherapist for the Halifax Blue Sox Rugby League Team, the Huddersfield YMCA Rugby Union Team, and currently as physiotherapist to professional golfer Chris Hanson who plays on the Euro Pro Tour. £25 per session (First session will include a full initial assessment). Book a course of 5 sessions and only pay for 4! £100 for 5 sessions. Add ear acupuncture onto a physiotherapy session for only £15. Partner & Group discounts available. Please call to discuss.